NOW IS THE WINTER OF OUR DISCONTENT, MADE GLORIOUS SPRING . . .
Then it was put to weed killer and most of the nineteenth-century plants ripped out. 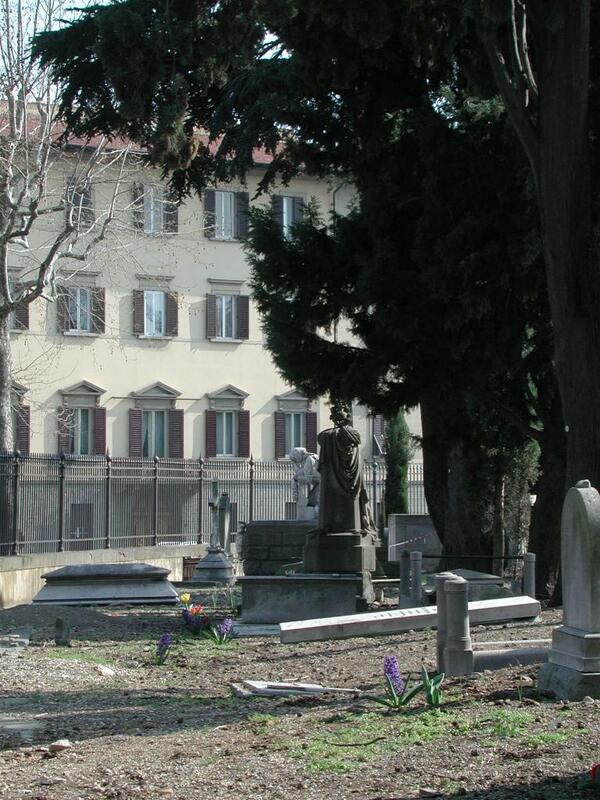 I have pleaded, in English and in Italian, that we restore it to the garden it had been. We no longer apply weed-killer. Instead I and friends weed out its stinging nettles, wearing rubber gloves to do so. And we have planted bulbs. 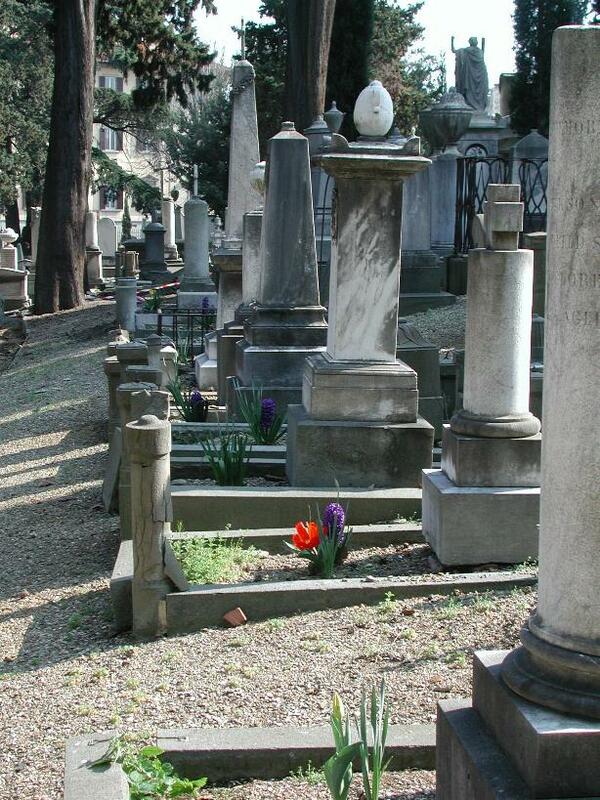 Given to us in memory of an aunt whose ashes were sent to New Zealand, so that she also be remembered in Florence, the city of flowers. 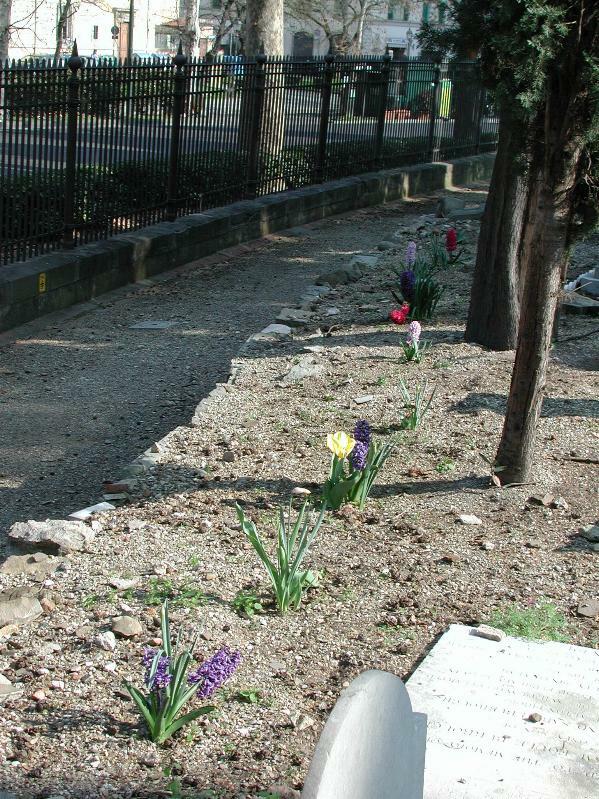 The hyacinths and narcissi perfume the entire graveyard. A Canadian grave. Her family used to send money each year for the upkeep of its little garden. 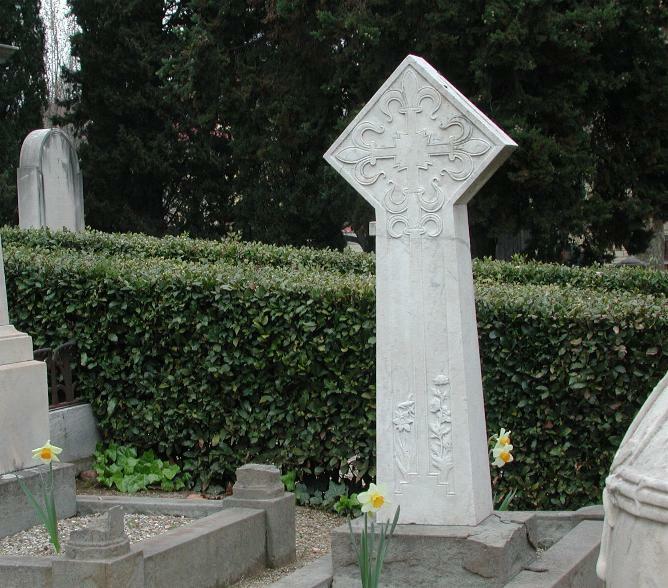 John Roddam Spencer Stanhope sculpted this for his daughter, with daffodils on the marble cross. 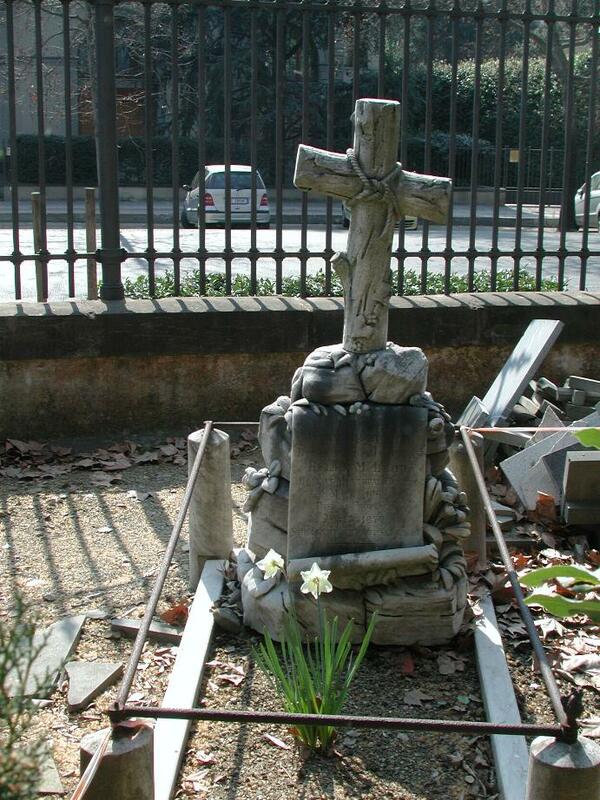 These real daffodils are in full bloom beside it as they had been in the nineteenth century. Beside it is the ark sculpted as if floated on waves by the other Pre-Raphaelite, William Holman Hunt, for his wife Fanny who died following childbirth. 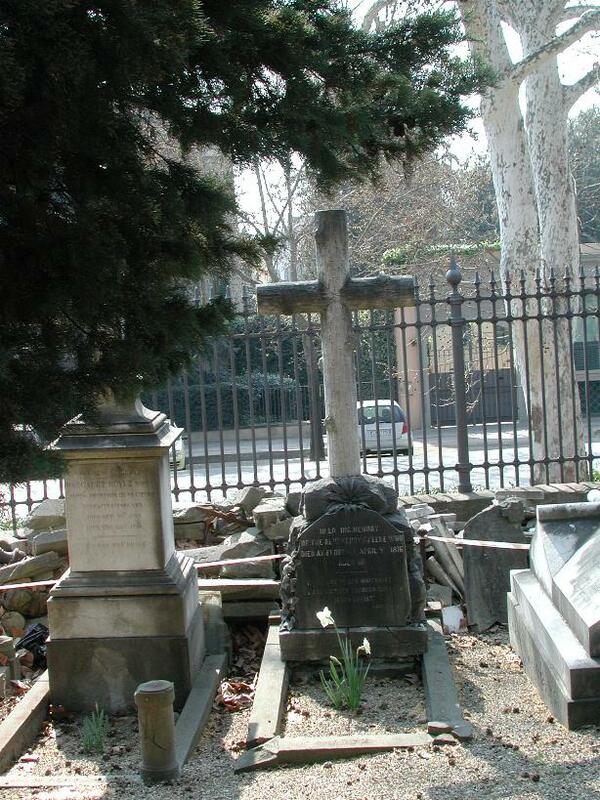 These two tombs are next to Lord Leighton's for Elizabeth Barrett Browning. All three of great beauty. 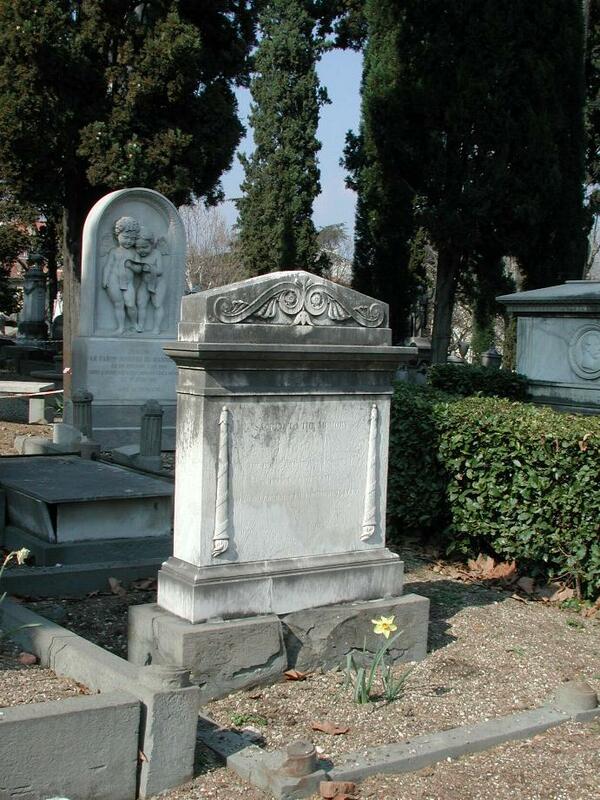 Franco Zeffirelli used this tomb for that of Elizabeth Barrett Browning in Tea with Mussolini. 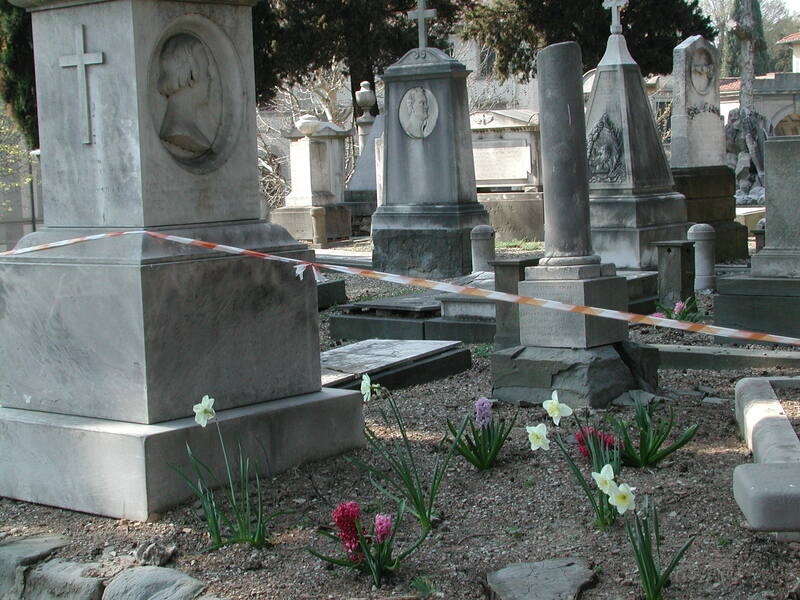 The red and white tape is to indicate that the Cemetery is in danger, likewise its visitors, until we can get it stabilized and restored. 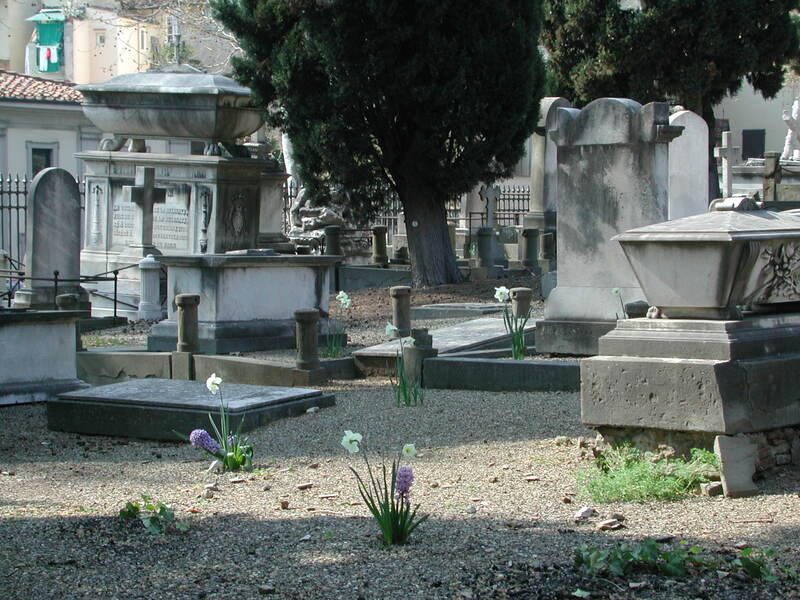 Flowers by the tombs of Southwood Smith and a Swiss self-taught artist. 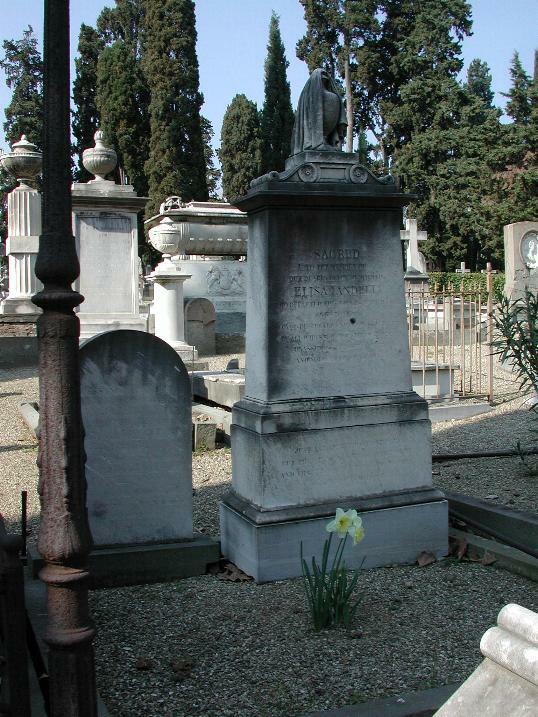 The young children of Pastor Dalgas are buried here. So we have planted two hyacinths for them. 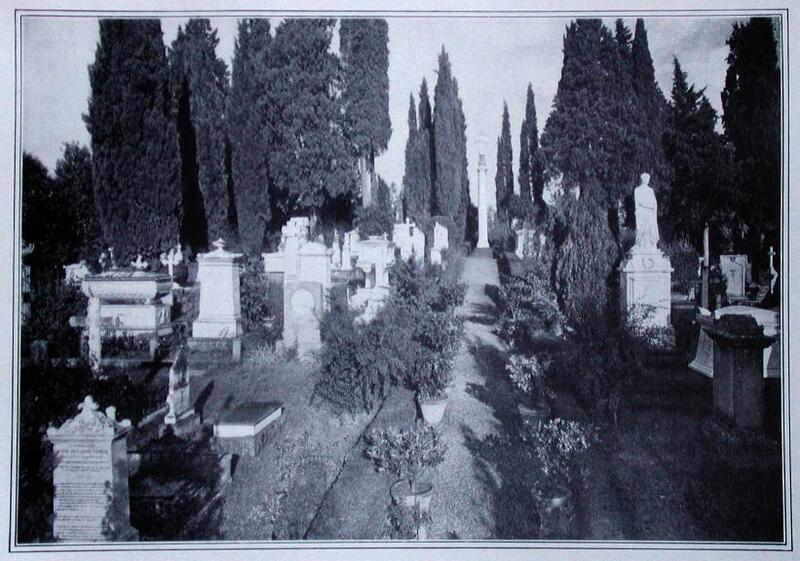 This is Russian Row, with many of its tombstones in Cyrillic. The gold and scarlet are tulips. 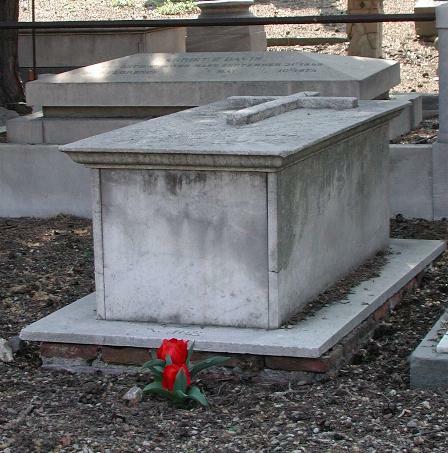 This is the tomb of the Rev. Charles Crossman. One young person used to sing the Beatles' song 'Strawberry Fields For Ever'. It is written on his gravestone. 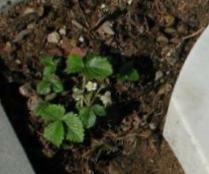 So we have planted strawberries on it, knowing that once there were wild strawberries growing on them. These came yesterday, from Vallombrosa. 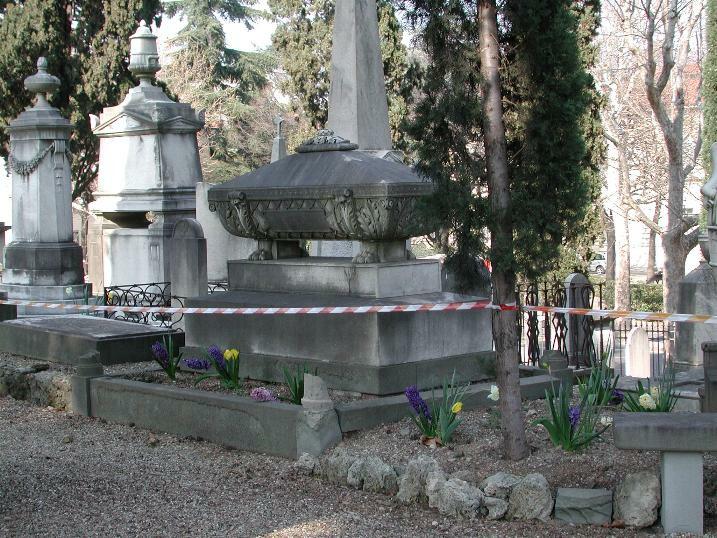 This month many more plants will be brought here, this time from the Giardino Torrigiani which supplied the original plants in the nineteenth century and so they will be from the same stock. 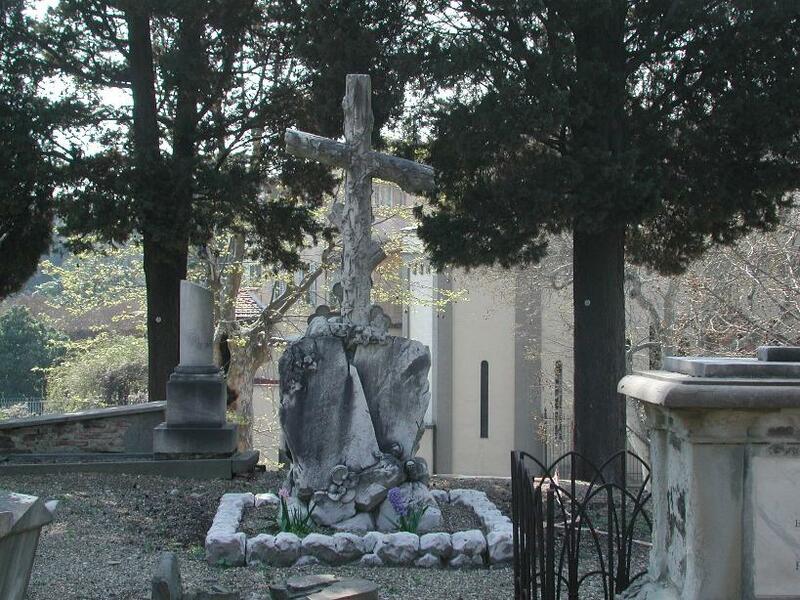 'That the Swiss-owned, so-called 'English' Cemetery in Florence be kept open, be restored and be declared a UNESCO World Heritage Site', and with 3130 signatures in-house from our visitors, for a total of 4471 signatures. We have decided to keep them coming.